Nerdie Foodies! Who is excited for Christopher Robin? We sure are! Rach and Roni have already seen it and loved it. 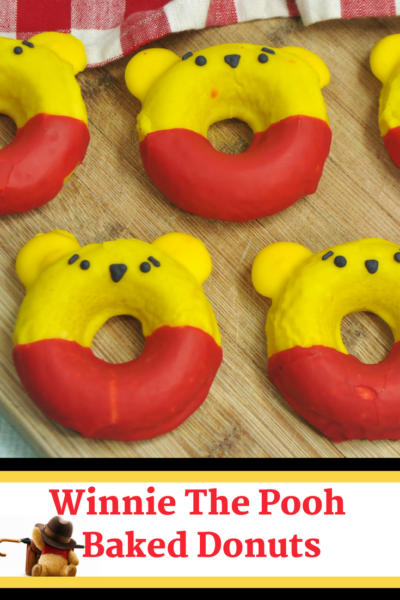 To get us into a Hundred Acre Wood state of mind with Pooh and his friends, let’s just jump right into these fun treat recipes and I snuck in an extra recipe for y’all because these are just too dang cute! 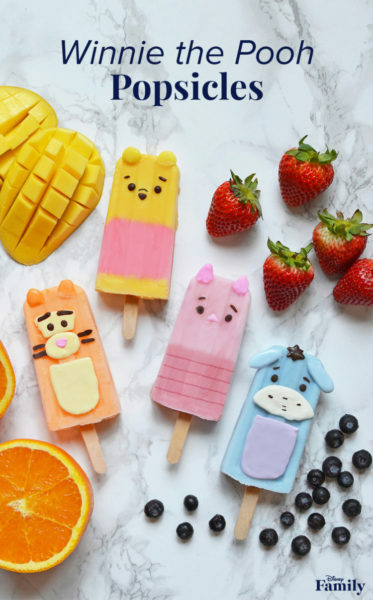 These Pooh inspired popsicles will keep you and the nerdlings cool for the remainder of summer! Disney Family contributor, Joanne Lu, shares with us her recipes for real fruit smoothies and turning them into familiar Thousand Acre Wood faces like Winnie, Eeyore, Piglet and Tigger. Check out the recipe here! These doughnuts are baked! Yep! You read that correctly. Baked doughnuts. Healthier than the deep-fried variety and if you’re making these at home, you’re not left with the fried grease smell in the home! Melanie (from Clementine County) shares with us her fun recipe here! 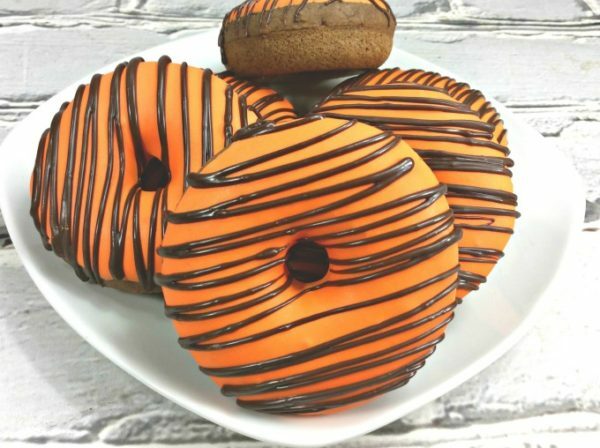 Another baked doughnut recipe, only this time, you’ll be making Winnie the Pooh doughnuts instead of Tigger doughnuts! Kimberly (from The Savvy Mama Lifestyle) shows us how in her blog tutorial here. And yes, they even include the Pooh bear ears! What are cupcake cones you ask? It’s exactly as it sounds – a piece of cake inside an ice cream cone. 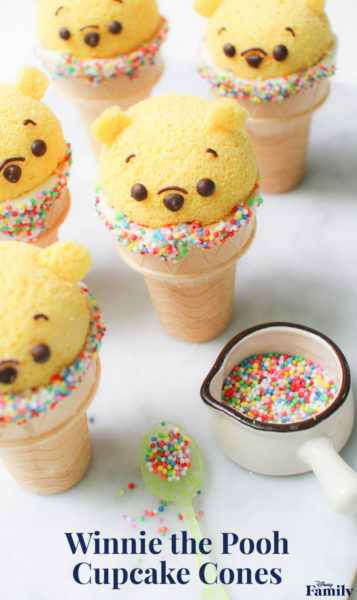 Only this time, decorated to look like the adorable Winnie the Pooh! And not going to lie, these treats are adorably cute! Disney Family contributor, Li Ming Lee, shares with us her tutorial here and there is even a video in the blog post that gives you a quick visual tutorial on how these are assembled. This is great for the nerdlings as an alternative to regular sized pizza. They’re cute to boot and are fairly simple to make if you need a last-minute dish. 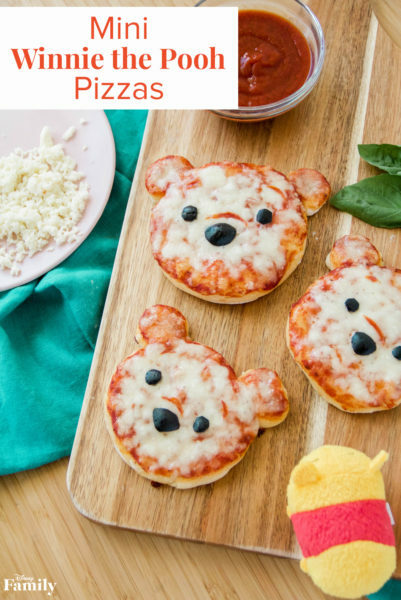 Disney Family contributor, Elise Apffel, shares with us how she makes these cute mini pizza pies here! In these next couple of recipes are for all you Nerdie Foodies out there who need gluten-free treats! 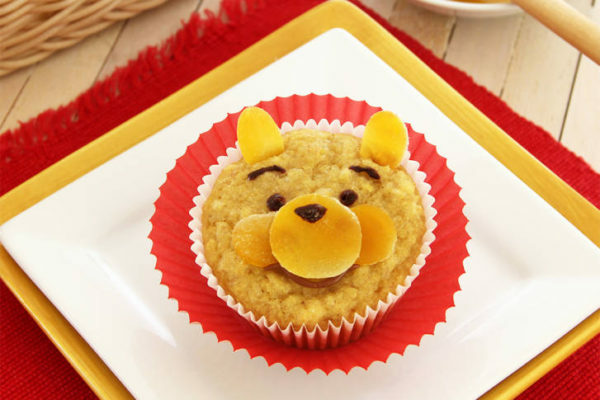 These adorable mini honey cakes would definitely be Instagram friendly and approved by Pooh bear himself. My Nguyen (from My Healthy Dish) shares with us her recipe here! 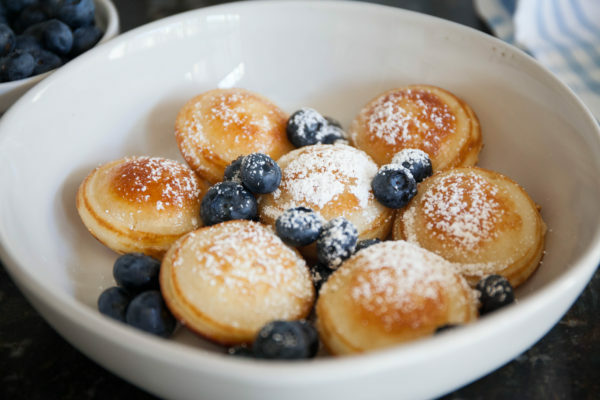 This recipe can double up as either a snack or breakfast. Thanks to Disney Family contributor, Rosie DeLibero, this recipe is a gluten-free, dairy-free, and nut-free recipe! Check out this fun and delicious muffin recipe here! Another fun and creative Disney Family recipe! This is a pudding parfait, and even though the video itself does not specify what kind of pudding they are using, it most likely will either be a vanilla custard pudding or maybe even a lemon flavoured pudding for that pale-yellow colouring. Check out this super easy dessert tutorial below! Now this was the recipe that started it all. 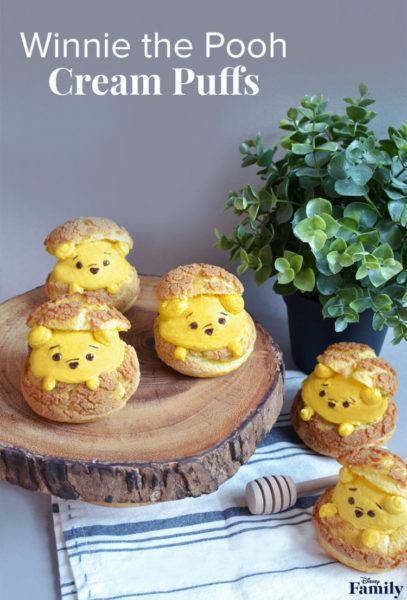 I came across this super-duper adorable picture of these cream puffs and I showed the NC ladies and everyone agreed that I had to do a Pooh inspired Nerdie Foodie for this week. So, thanks to Disney Family contributor Joanne Lu for being the catalyst for this post. This recipe uses the traditional choux pastry to make the cream puffs themselves, so it is a slightly more advanced recipe, but does not mean that a novice baker can attempt. Check out the recipe here! Now this is a decadent dessert. A chocolate base with a creamy, chocolate-y mousse filling. Tastemade are the creators of this recipe, so if you don’t have a sweet tooth, you might want to skip this recipe. If you want to venture into this sweet and tasty treat, you can find the recipe with an accompanying video at the top of the blog post, here! 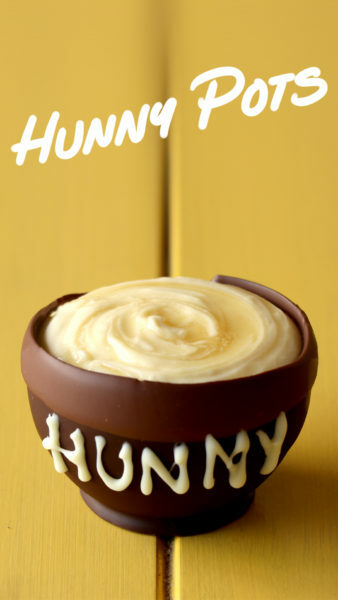 This Hunny pot is so life-like you won’t believe it is all cake and all edible! Ashlee Marie is the genius baker behind this creative mini cake! It truly looks so real that even I had to do a double take. Check out the recipe and step-by-step tutorial here! And there you have it! 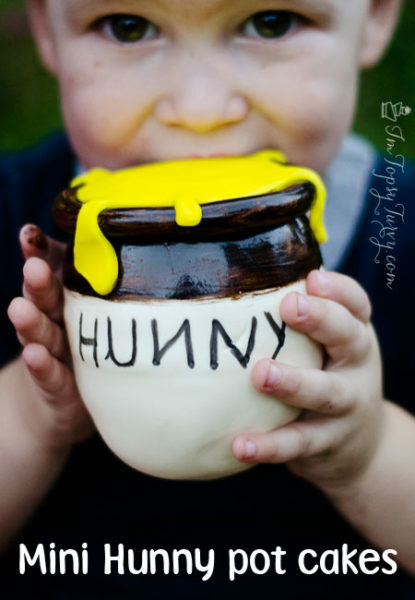 Hope these treats that are full of hunny will help you transport to the Thousand Acre Woods! If you haven’t already, head out to see Christopher Robin in theatres now! Tagged Allergy Friendly, Ashlee Marie, Baked Donuts, Cake, Christopher Robin, Clementine County, Corn Muffins, Cream Puffs, Cupcake Cones, Dairy Free, Disney, Disney Family, Donuts, Doughnuts, Eeyore, Gluten Free, Honey, Honey Cakes, Hunny Pots, Mini Cakes, Mini Pizza, Movie, My Healthy Dish, Nerdie Foodie, Nut Free, Parfait, Piglet, Pooh, Pooh Bear, Popsicles, Tastemade, The Savvy Mama Lifestyle, Thousand Acre Woods, Tigger, Winnie The Pooh.